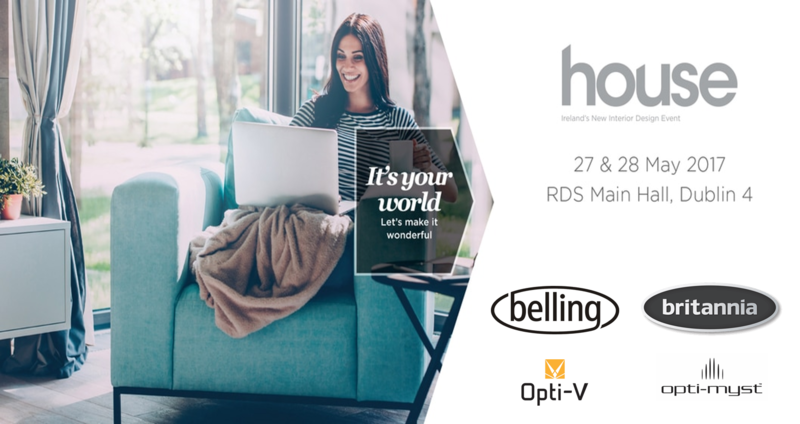 For the second year running, Glen Dimplex Ireland was at the home interior event of the year – house, which took place in the RDS last weekend. Being much more than an exhibition, house is the definitive guide to the most stylish home interiors, providing visitors with a wealth of advice and inspiration. Along with the great selection of quality exhibitors, Glen Dimplex Ireland was there to showcase the new collection of affordable range cookers from Belling, the Farmhouse and Cookcentre. Renowned for producing affordable appliances geared towards family life, the new collection of range cookers from Belling affirm the brands reputation for quality and reliability. To find out more about the products showcased, please click here. Also on display were the stunning Delphi and Q-Line range cookers from Britannia Living. Packed with features designed to impress and built to last, Britannia Living embodies high quality range cookers and premium appliances. For more information on the complete collection from Britannia Living, please click here. Dimplex, a leading name in heating, took the opportunity to present its most eye-catching statement fires from the Opti-myst and Opti-V collections. The Opti-myst cassette & Opti-V PGF20 were a major talking point of the event, with the unique flame & smoke effects from both fires proving a huge hit with visitors. To view the full collection of Dimplex fires, please click here. From the array of art in the Art Loft to kitchen, bathrooms and bespoke furniture, house presents visitors with an aesthetic that is not only aspirational but also attainable. To learn more about the house event, click here.